YOU NEED AN ILOK OR ELICENSER DONGLE TO AUTHORIZE THIS VERSION OF XILS Vocoder 5000 !!! 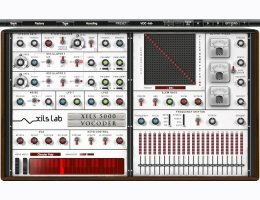 Inspired by the EMS Flagship Vocoder ( EMS 5000 -1976- Probably the most complex and powerful analog Vocoder ever built) , XILS-lab used his knowledge acquired during the emulation of both the VCS3 synthesizer and the VP300 VocoderPlus to develop the XILS Vocoder 5000 Model. You can also process Drums, percussive elements, or Guitars and … every kind of synthesizer itself, to breathe some analog life into them, or completely reshape them. You can even derive some pure synth patterns from …. drumloops. Everything is possible. The XILS Vocoder 5000 is a truly 21st Century product par excellence in its own right include additional filter types; more SLEW RATE modulations; two LFOs — the original Vocoder 5000 had only one; in-depth FM AMNT (Frequency Modulation amount) and PWM AMNT (Pulse Width Modulation amount) controls; additional oscillator waveforms; improved SPEECH (sibilance) input detector; GATE input; and also a keyboard for playing melodies or chords. Unlike the restrictive nature of the original Vocoder 5000’s ‘real world’ pin matrix patchboard, XILS Vocoder 5000 users can quickly populate its onscreen matrix by freely drawing lines... and it helpfully has its own presets! Picture-perfect, some might say!